Planet Hollywood Observatory, a restaurant destination dedicated to celebrating the entertainment industry, is now open in the Town Center at Disney Springs. Centrally located and overlooking the heart of Disney Springs, Planet Hollywood’s iconic globe has been reimagined and renovated into a four-story stargazing observatory with a newly expanded outdoor terrace and bar. The restaurant invites Guests of all ages to “Dine Amongst the Stars” with an immersive theatrical dining experience. Each floor of Planet Hollywood Observatory provides a different experience so that Guests can return again and again, discovering a new adventure each time. 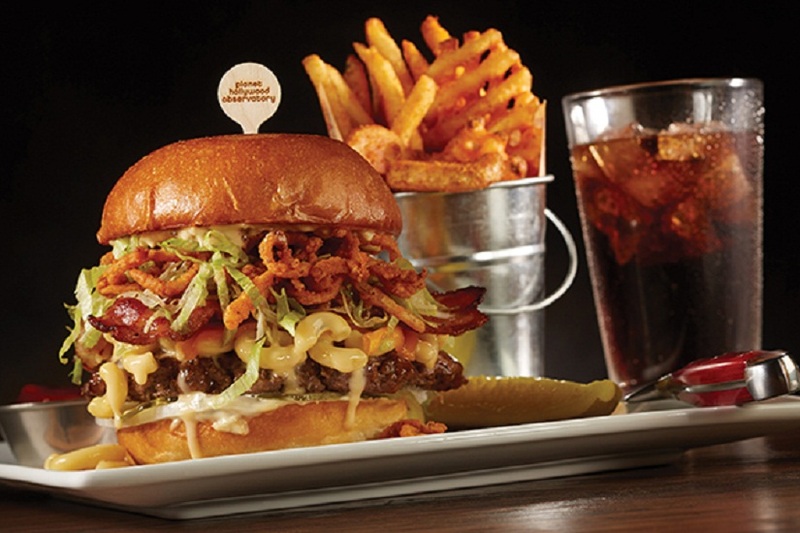 An enhanced menu highlights Planet Hollywood’s classic dishes, introducing a savory selection of “Big Bite Burgers” and “Knuckle Sandwiches” from dynamic chef, restaurateur and television personality Guy Fieri and new over-the-top desserts. Planet Hollywood Observatory is located next to the Coca-Cola Store and is open daily for lunch and dinner. PHOTOS & LOGO: © 2017 Planet Hollywood/Walt Disney World Resort. All Rights Reserved.